Transferred to Nobles and Church Dignitaries. The Bible gives scant information concerning the secular or political taxes of the Jews. Practically all that can be gathered is the following: Just as Abraham (Gen. xiv. 20) voluntarily gave a tenth "of all" (i.e., according to the context, of the whole spoil taken in war), so the Israelitish and foreign subjects of the kings of Israel voluntarily brought presents to their rulers.These gifts were withheld by churlish people only (comp. I Sam. x. 27), but were given by all others (ib. xvi. 20; II Sam. viii. 2, 11 et seq. ; xii. 30; I Kings x. 10, 25; II Kings iii. 4; II Chron. ix. 24; Isa. xvi. 1; Ps. lxxii. 10). A chief source of the king's income consisted in his landed possessions (I Chron. xxvii. 25 et seq. ; II Chron. xxvi. 10); but a money-or poll-tax is not mentioned among the royal prerogatives, even in the detailed description of them with which Samuel tried to deter the people from choosing a king (I Sam. viii. 11-17). The census of the people which was ordered by David (II Sam. xxiv. 1 et seq.) was intended perhaps to furnish a basis for a methodical distribution of the military burdens and taxes; but Solomon was the first monarch to systematize the furnishing of foodstuffs (I Kings iv. 7-28), and to demand toll from the merchants (ib. x. 15), and he, moreover, made the lot of the people an inordinately heavy one (xii. 4), probably imposing an additional money-tax. The later kings again received only voluntary gifts from their subjects, as is recorded of the time of Jehoshaphat and Hezekiah (II Chron. xvii. 5, xxxii. 23), a money-tax being levied in time of war only, when the demands of victorious enemies had to be satisfied (II Kings xv. 20, xxiii. 35). The repugnance of the free Israelites to the payment of a money-tax was overcome by the post-exilic foreign rulers. Although the Persian kings exempted the priests and Levites (Ezra vii. 24), they demanded toll ( ) and other imposts which likewise had to be paid in money (Ezra iv. 13; Neh. v. 4: "We have borrowed money for the king's tribute"). The taxes often grew to be an especially heavy burden under the Ptolemaic and Seleucidan kings. These rulers employed tax-farmers, who, of course, endeavored not only to collect the taxes, but also to derive a large personal profit in addition (I Macc. xi. 28, xiii. 15; Josephus, "Ant." xii. 4, §§ 1, 4 et seq.). Josephus (in the passage just cited) narrates that Joseph, the son of Tobias, accumulated great wealth as a tax-farmer, although he had to pay to the Egyptian king Euergetes the enormous sum of 16,000 talents. The Seleucidan kings likewise demanded a poll-tax (I Macc. x. 29: φόρους, according to "Ant. "xii. 3,§ 3, denoting what is paid per head). This tax was imposed by the Roman rulers also. Julius (Cæsar, it is true, showed himself very lenient toward the Jews, and even was considerate with regard to the Sabbatical year ("Ant." xiv. 8, § 3); but under Augustus conditions changed. During the latter's reign a "descriptio orbis" was completed, in which the property of the inhabitants of the whole Roman empire was set down. He chose twenty of the most eminent men, and sent them into all the countries of the subjugated peoples, to make a list of persons and property; moreover he wrote with his own hand a "breviarium totius imperii," which contained a list of the number of citizens carrying arms and of the allies, of the tributes or taxes, etc. This census was introduced into Judea when Herod's son Archelaus was removed, in the year 760 of the foundation of Rome, and was exiled to Vienna in Gaul; it is mentioned in Matt. xxii. 17. The precise amount of this tax is not known, nor can it be estimated with certainty from the fact that the denarius is called the "coin of the census" (A. V. "tribute money") in Matt. xxii. 19; for these words may mean also "a sample of the Roman coins with which the tribute is paid." In any case the tax imposed by the Romans was high and oppressive. Refusal to pay taxes involved rebellion against the suzerainty of the Romans, as in the case of Judas the Gaulonite in the year 760 of the foundation of Rome ("Ant." xviii. 1, § 1). Franz Walter, Die Propheten in Ihrem Socialen Berufe, 1900, p. 26. A direct result of the persecutions of the Jews in the eleventh and twelfth centuries was that they came under the immediate protection of the rulers; this, in turn, led to their becoming Kammerknechte. The imperial rights were often transferred to minor rulers. Thus, the widow of Duke Roger of Apulia bequeathed to the church of Salerno the revenues derived from the Jews; and in like manner the Jews of Bohemia, in the twelfth century, came under the immediate protection of the Bohemian princes. In the thirteenth century the Jews became at times the wards of the ecclesiastical potentates also, to whom they were then obliged to pay their taxes. For example, in 1209 the taxes paid by the Jews of the archbishopric of Mayence fell into the coffers of Archbishop Siegfried; in 1212 the Jewish taxes for Provence were paid to the church of Arles. (1) The Coronation Tax: When this tax was introduced is not known; but the Jews of the entire German empire were compelled to pay a certain sum whenever a new ruler ascended the throne. At the coronation of Philip the Fair the Jews of Champagne paid a tax of 25,000 florins French money; while the Jews of Italy, upon the accession of a pope, paid a tribute consisting of one pound of pepper and two pounds of cinnamon. (2) Taxation on Dress: In 1405 the Jews of several German and French cities were allowed to purchase exemption from wearing the Jewish badge by payment of a higher annual tax (Weizsäcker, "Reichstagsacten," v. 637). (3) The Golden Opferpfennig: Introduced by Ludwig the Bavarian (1342). The income derived from this tax amounted in the fourteenth centuryto 30,000 gulden. Beginning with the seventeenth century it was gradually abolished ( see Opferpfennig, Goldener). (4) Judengeleitsgeld: For each safe-conduct a payment of 1 turnose was exacted, and even a Christian, if traveling with a Jew, had to pay this fee. (5) Landfrieden Protection Tax: This was one of the heaviest taxes imposed upon the Jews, and was paid only when the latter had been publicly assured that protection had been granted them, as, for example, by Henry IV. (1103) and Henry of Hohenstaufen (1254), by the cities of Worms, Mayence, and Oppenheim (1260), and by Archbishop Werner of Mayence (1265). (6) The Leibzoll (see Jew. Encyc. vii. 669). (7) The Real Estate and Building Tax: Levied as early as the ninth century. When a Jew purchased a house or a lot he placed himself under the protection of the local church or monastery, to which he paid a certain tribute: for a house, one-tenth of the income derived from it; for a lot, a certain quantity of barley, wheat, and wine. The custom of acquiring real property under the protection of the Church was rendered more difficult during the thirteenth century, measures against it being taken in Normandy, 1222, in northern Germany, 1240, in Gascony, 1288, and by Charles of Valois, 1324. Toward the middle of the fifteenth century it fell entirely into disuse. (8) The Reichssteuer: Imposed by the emperor Wenceslaus (1383). 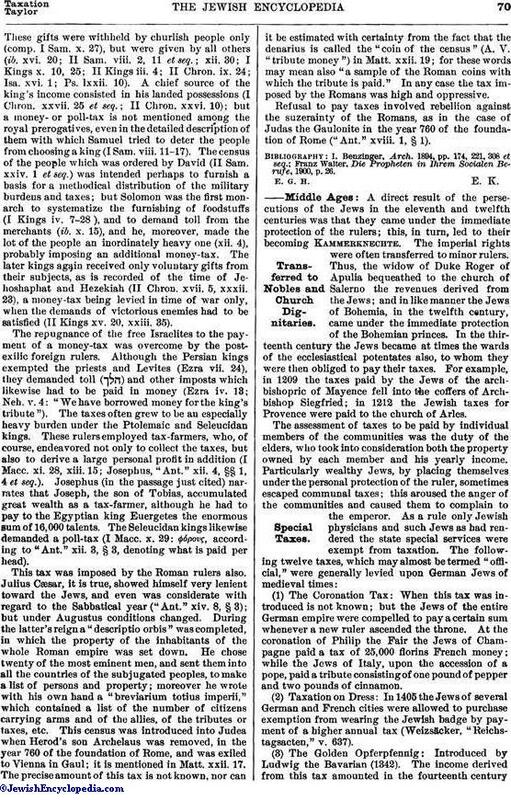 The right to levy taxes upon the Jews was granted to cities only on condition that one-half of the income thus derived should be paid into the treasury of the state. A similar Jewish tax existed in France from the middle of the fourteenth century. 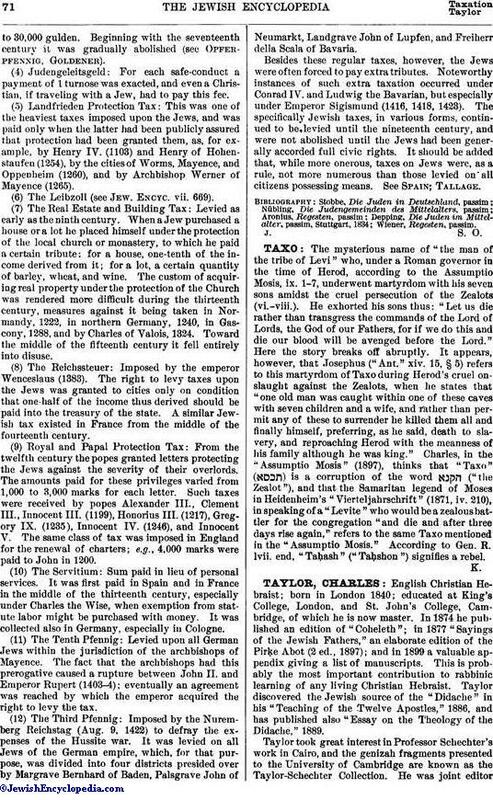 (9) Royal and Papal Protection Tax: From the twelfth century the popes granted letters protecting the Jews against the severity of their overlords. The amounts paid for these privileges varied from 1,000 to 3,000 marks for each letter. Such taxes were received by popes Alexander III., Clement III., Innocent III. (1199), Honorius III. (1217), Gregory IX. (1235), Innocent IV. (1246), and Innocent V. The same class of tax was imposed in England for the renewal of charters; e.g., 4,000 marks were paid to John in 1200. (10) The Servitium: Sum paid in lieu of personal services. It was first paid in Spain and in France in the middle of the thirteenth century, especially under Charles the Wise, when exemption from statute labor might be purchased with money. It was collected also in Germany, especially in Cologne. (11) The Tenth Pfennig: Levied upon all German Jews within the jurisdiction of the archbishops of Mayence. The fact that the archbishops had this prerogative caused a rupture between John II. and Emperor Rupert (1403-4); eventually an agreement was reached by which the emperor acquired the right to levy the tax. (12) The Third Pfennig: Imposed by the Nuremberg Reichstag (Aug. 9, 1422) to defray the expenses of the Hussite war. It was levied on all Jews of the German empire, which, for that purpose, was divided into four districts presided over by Margrave Bernhard of Baden, Palsgrave John of Neumarkt, Landgrave John of Lupfen, and Freiherr della Scala of Bavaria. Besides these regular taxes, however, the Jews were often forced to pay extra tributes. Noteworthy instances of such extra taxation occurred under Conrad IV. and Ludwig the Bavarian, but especially under Emperor Sigismund (1416, 1418, 1423). 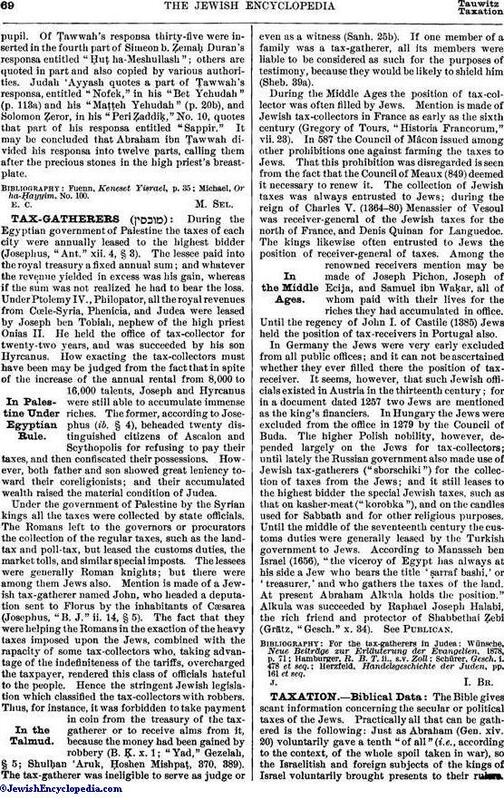 The specifically Jewish taxes, in various forms, continued to be levied until the nineteenth century, and were not abolished until the Jews had been generally accorded full civic rights. It should be added that, while more onerous, taxes on Jews were, as a rule, not more numerous than those levied on all citizens possessing means. See Spain; Tallage.